Interstate 17 is the main north-south freeway in Arizona, connecting Phoenix with Flagstaff. It is a heavily traveled, regional corridor that connects Interstate 10 with Interstate 40. Within Phoenix, I-17 travels the Black Canyon Freeway, one of the older freeways in the city completed in the early 1960s1. It leaves the urban area and enters the central Arizona desert, with a former business loop (decommissioned in 2011) serving Rock Springs and Black Canyon City. Interstate 17 turns northeast and begins its ascent onto the Mogollon Plateau after the split of Arizona 69 toward Prescott at Cordes Junction. This requires a significant elevation increase between the desert floor and the top of the plateau, and the views are rewarding. I-17 traverses Coconino National Forest for its remaining distance to Flagstaff, with a forest landscape that is significantly different from the desert below. The freeway has two major connections to the famous Sedona area, via Arizona 260 near Camp Verde and Arizona 179 near Rimrock. I-17 continues through national forest land until meeting I-40, and the freeway ends at an early 2000s-rebuilt cloverstack interchange. Arizona 89A (Milton Road) stems north from the freeway end as a surface street into the city center of Flagstaff. The northernmost reaches of Interstate 17 replaced U.S. 89 Alternate. 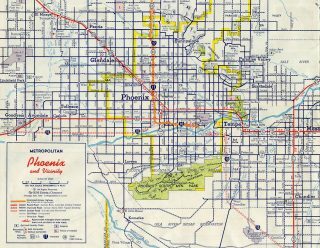 The remainder of the route replaced Arizona 69, to U.S. 89, which ran in tandem through Downtown Phoenix along side U.S. 60-70-80. The Black Canyon Freeway, originally constructed in Phoenix between Jefferson Street and Northern Avenue with four lanes, was designed for 20,000 vehicles per day (vpd). As of 2003, the same highway carried up to 220,000 vpd amid six through lanes and two HOV lanes. The freeway is home to routine traffic back-ups. Expansion options to mitigate traffic congestion along I-17 were included in the Maricopa Association of Government 20-year Regional Transportation Plan. Funds earmarked for Interstate 17 in the plan included one study to build an upper deck to the freeway. Inspiration for the I-17 plan was derived from the construction of a second deck for the Leroy Selmon Expressway (SR 618) in Tampa, Florida, in addition to the population density adjacent to the Black Canyon Freeway. This east-west tollway was expanded as part of a $350 million in construction between April 2004 and July 2006. Six miles of roadway were added for the use of reversiable traffic flow. These were supported with single pier-supports placed within the tollway median. Within Phoenix, the second deck of the Black Canyon Freeway was considered for the stretch between Interstate 10 (Exit 199) north and Dunlap Avenue (Exit 207), a distance of eight miles. No progress was made since and by 2011 a new I-17 Corridor Improvement Study was underway. This ADOT study was rescinded in 2012, along with the concurrent ADOT I-10 Corridor Improvement Study. Planning, engineering and environmental information derived from those studies were folded into a new I-10/I-17 Corridor Master Plan. Referred to as the “Spine”, because of its role as the backbone of transportation mobility in the Phoenix area, the study pertains to 35 miles of I-10 and I-17 from Loop 202 to the south and Loop 101 to the north. The first round of public meetings on the Spine Study were conducted by the Maricopa Association of Governments in partnership with ADOT and the FHWA in March 2015. Interstate 17 is completed from Phoenix to Flagstaff, while Interstates 70 and 15 would complete the connection to Salt Lake City. The costs to construct this route, both economic and environmental, would be significant. Such an extension is merely speculative at this time. Portions of Interstate 17 were open to traffic by 1964, including the Black Canyon Freeway in Phoenix and upgraded sections of Arizona 69 around Black Canyon and Cordes Junction. A super-two section of Arizona 79 bypassed Sedona. It was four-laned by 1976. 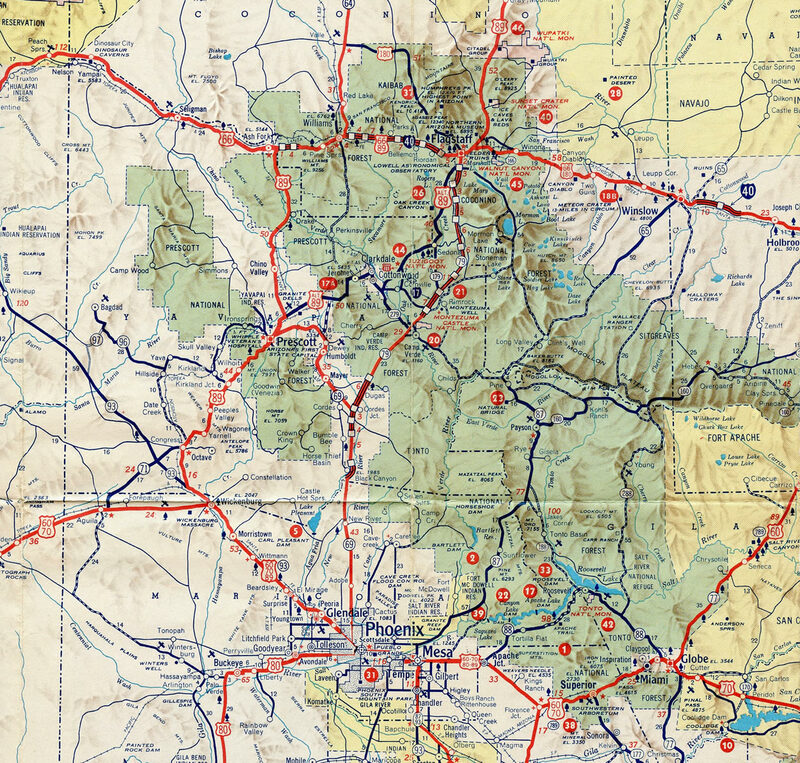 This 1965 Phoenix inset shows the east-west leg of I-17 as part of I-10. The proposed alignment of I-10 parallel to Buckeye Road shifted northward in 1964. This section would not be completed until 1990. The Black Canyon Freeway opened first in 1958 at Grand Avenue (U.S. 60) and Thomas Road. Subsequent sections opened in 1960 north to Glendale Avenue (Exit 205) and 1961 from Exit 205 to Dunlap Avenue (Exit 207). 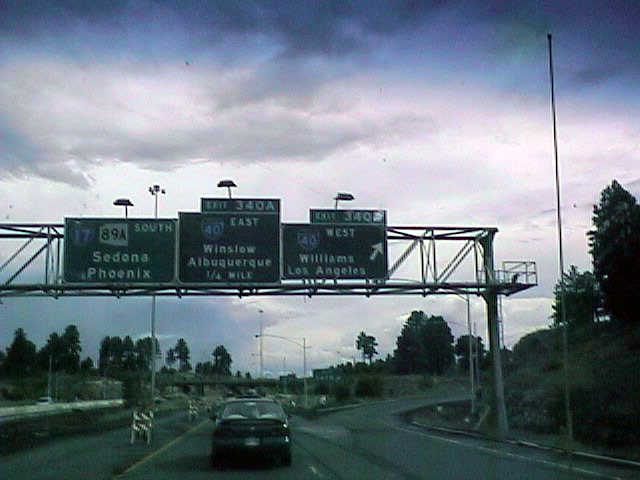 Previous control points for I-40 at the southbound beginning of I-17 included Arizona city of Winslow and town of Williams. Photo taken by Jonathan Osborne (07/99). Interstate 17 between Phoenix and Cordes Junction (Exit 262), replaced the southern extent of Arizona 69. This is significant because the exit numbering scheme still follows the original mileage of Arizona 69. According to the Misc.Transport.Road FAQ (Marc Fannin) and based on comments from Richard C. Moeur, a unique milepost system was utilized in Arizona until the mid-1980s. 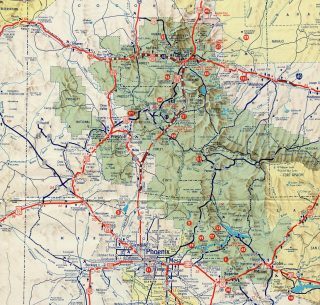 The system specified that any route that did not enter Arizona from another state used the mileage of the intersecting route’s mileage at its south or west end as its starting value. The former route of Arizona 69 originated from U.S. 89 at milepost 201. Since I-17 & AZ 69 were overlapped originally, the exit numbers along the freeway used the mileposts of AZ 69. The exit numbers on Interstate 17 are not related to those of Interstate 19. 174 miles separates the respective south ends. The Black Canyon Freeway was the first section of I-17 to be built, with construction opening segments from I-10 northward to Little Deer Valley between 1958 and 1965. The freeway was completed in 1978 when the road north from Exit 268 (Dugas Road) through Spring Gulch to Arizona 169 (Exit 269) opened to traffic. See the I-17 Arizona guide for the rest of the time line. Interstate 17 northbound, two miles south of Exit 340A/B – Interstate 40. This is one of five Flagstaff area interchanges. Photo taken 05/24/03. With the San Francisco Mountains on the horizon, Interstate 17 continues to within one mile of the terminal interchange with Interstate 40. Photo taken 05/24/03. Interstate 17 northbound expands to three lanes with the approach to Exit 339/Lake Mary Road to Mormon Lake. The stack interchange with Interstate 40 is 0.75 miles to the north. Photo taken 05/24/03. Exit 339 departs as Interstate 17 nears Interstate 40. The interchange and northernmost reaches of Interstate 17 were recently reconstructed to expand capacity and allow for higher speed ramps between I-17 and Interstate 40. Photo taken 05/24/03. Exit 340A leaves Interstate 17 northbound for Interstate 40 east. While the control city is Albuquerque, Interstate 40 also serves the Arizona towns of Winslow at Exit 252, Holbrook at Exit 285, and Chambers at Exit 333. Photo taken 05/24/03. Results of the aforementioned construction project culminate with this high flyover from Interstate 40 west to Interstate 17 south. A cloverleaf ramp facilitates the traffic movements to Interstate 40 westbound from Interstate 17 north via Exit 340B. Interstate 40 travels 30 miles to Williams, 147 miles to Kingman, and 177 miles to Bullhead City via a connection with U.S. 93 and Arizona 68. Photo taken 05/24/03. Arizona 89A extends from the north end of I-17 to Business Loop I-40 in Downtown Flagstaff. The ensuing ramp connects with McConnell Drive at Exit 341.Photo taken by Justin Cozart (10/02). Exit 340B departs from Arizona 89A south for I-40 west to Kingman and Barstow, California. Reconstruction of this exchange added a flyover from I-40 west to I-17 south. Photo taken by Justin Cozart (10/02). A loop ramp connects Arizona 89A and I-17 south with Interstate 40 east to Gallup and Albuquerque, New Mexico. Photo taken by Justin Cozart (10/02). Two mile guide sign on Interstate 40 westbound for Interstate 17/Arizona 89A/Exit 195. Somewhat typical in many two mile advance signs on the Interstate system for Interstate junctions, no control cities are placed. Photo taken by Justin Cozart (10/02). Downtown Phoenix lies 140 miles to the south along Interstate 17 while Barstow, California is another 352 miles to the west. Sedona (via Arizona 89A south) is located 32 miles to the southwest. Photo taken by Justin Cozart (10/02). Exit 195 separates from I-40 westbound for I-17 south and Arizona 89A. Arizona 89A concludes at Arizona 89 near the city of Prescott 91 miles to the southwest. The state route begins from U.S. 89 at Interstate 40 and Ash Fork. Photo taken 05/24/03. Nearing the gore point for Exit 195 on Interstate 40 westbound. Interstate 17 lowers from an elevation of 6,910 feet here at Flagstaff to 1,090 feet at the capital city of Phoenix. Photo taken 05/24/03. Interstate 40 west at the former cloverleaf ramp for I-17 and U.S. 89 south. Photo taken by Michael Summa (1988). Interstate 40 eastbound at the terminus of Interstate 17. U.S. 89A, which has since been downgraded to Arizona 89A, overlapped with Interstate 17 from Flagstaff southward. Photo taken by Bill Manning (08/78). These are the last reassurance shields along southbound Interstate 17 and eastbound U.S. 60 before meeting Interstate 10 southeast of downtown Phoenix. Photo taken 10/27/03. Southbound Interstate 17 and eastbound U.S. 60 approaches Exit 195A, 16th Street (last exit southbound) followed by its second and final junction with Interstate 10 in one mile. Photo taken 01/17/05. The final exit along southbound Interstate 17 and eastbound U.S. 60 is Exit 195A, 16th Street. The final off-ramp, which connects southbound Interstate 17 with northbound (westbound) Interstate 10 to Sky Harbor International Airport at Exit 194, approaches. Photo taken 01/17/05. The connection from southbound Interstate 17 and eastbound U.S. 60 to westbound Interstate 10 and Sky Harbor International Airport is via Exit 194 in the right lanes. The left lanes default onto eastbound Interstate 10 and U.S. 60. Photo taken 01/17/05. Interstate 17 ends at its second interchange with Interstate 10; although signed as southbound, Interstate 17 is headed due east at this point. Westbound Interstate 10 leads north to Sky Harbor International Airport and downtown Phoenix. Eastbound Interstate 10 and U.S. 60 lead south to Tempe and southeastern Phoenix, with connections to Mesa, Globe, and Apache Junction via U.S. 60 and Tucson via Interstate 10. Photo taken 01/17/05. An end shield is posted for the southern terminus of Interstate 17 as southbound merges onto eastbound Interstate 10. (There use to be an end shield at the north end of Interstate 17, but it was taken down when the Flagstaff interchange with Interstate 40 was reconstructed.) This shield was the only remaining end sign or shield posted on any of the Arizona statewide Interstates. Photo taken 01/17/05. The first northbound Interstate 17 reassurance shield and associated U.S. 60 overlap. The two routes coincide with one another to Exit 201/Grand Avenue. There U.S. 60 travels surface streets for the first time in Phoenix en route to Glendale, Peoria, Surprise and ultimately Wickenburg and the southern terminus of U.S. 93. Else wise Interstate 17 will again interact with Interstate 10 in approximately five miles. Photo taken by Justin Cozart (10/02). The first indication of the upcoming Interstate 17 southern terminus is this Exit 150A overhead, 1.50 miles to the east. Due to the tunnels of Interstate 10 north of Downtown, Hazardous Cargo is relegated to Interstate 17 on the southside of the central business district. Photo taken 05/24/03. Westbound Interstate 10 expands to seven lanes in preparation for the split with Interstate 17 north/U.S. 60 west. Exit 150B comes into play with 24th Street before the Interstate 17 terminal. Photo taken 01/17/05. Auxiliary overhead for Exit 150B reminding motorists to use Interstate 17 for U.S. 60 based traffic interests to the northwest. 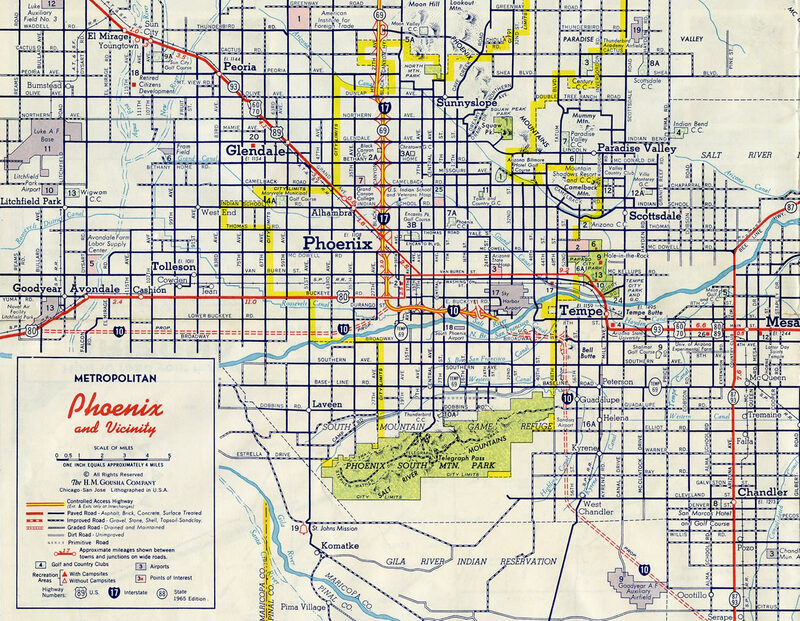 Incidentally, U.S. 60 is the last remaining US route within the Phoenix metropolitan area. Gone are U.S. 70, U.S. 80, U.S. 89, and Arizona 93 (was it to be future U.S. 93 at one time?). Since most of these routes all shared the same road (Van Buren Street), it was much easier to turn back most of these routes. Photo taken 05/24/03. Interstate 17 begins and U.S. 60 splits with Interstate 10 westbound. Also to the right Exit 150B departs for 24th Street. Photo taken 01/17/05. The left four lanes continue northwest on Interstate 10 toward Sky Harbor International Airport and Arizona 51/Piestewa Freeway. The right three lanes transition onto northbound (westbound) Interstate 17 and U.S. 60. Los Angeles, California is 420 miles to the west along Interstate 10. Photo taken 01/17/05. This is the first indication along eastbound (southbound) Interstate 10, just prior to the airport exit east of downtown Phoenix. Photo taken 01/17/05. The right lane exits to Exit 150, Interstate 17 north and U.S. 60 west. Note that U.S. 60 is omitted to alleviate confusion with the Superstition Freeway interchange. Photo taken 01/17/05. Eastbound Interstate 10 approaches Exit 150, Interstate 17 north. Interstate 10 and Interstate 17 form an inner belt surrounding downtown Phoenix. Photo taken 01/17/05. A quarter mile further south, eastbound Interstate 10 reaches Exit 150, Interstate 17 north. This interchange marks the southern end of Interstate 17. Photo taken 01/17/05. “Double deck urged for I-17 in Phoenix.” The Arizona Republic, September 16, 2003. “$15.7 billion transit plan endorsed.” The Arizona Republic, September 18, 2003. Page updated July 6, 2015.